אוכלים: צהריים טריים בקוק שופ לא חסר איפה לאכול בצ'לסי, אז במקום להסתבך אנחנו ממליצות ללכת ישר לקוק שופ: מסעדה מקסימה ואינטימית שמדגישה חומרי גלם אורגניים בגידול מקומי, במחירים לא יקרים במונחי ניו יורק. עם נופים מדהימים על העיר ותפריט אלכוהול יוקרתי, הבר על הגג של מלון הסטנדרט הוא אחלה דרך לסגור את היום ולהרגיש הכי ניו יורק שיש. הכניסה מגיל 21 ומעלה. ההאדסון יארדס, קומפלקס חדש שמכונה גם "אי המיליארדרים" הוא מתחם ענק שנפתח בצפון ההיי ליין ובמרכזו מבנה אדריכלי ענק ששואף להפוך להיות ה"אייפל" של ניו יורק, אזורי שופינג ואומנות. במתחם נפתח לאחרונה מוזיאון The Shed, מוזיאון ראשון מסוגו שמוקדש לאמנות הפרפורמנס. המבנה החדש תוכנן על ידי משרד האדריכלות היוקרתי Diller Scofidio + Renfro ומהווה אטראקציה בפני עצמה מעבר לתערוכות במוזיאון. חצי מהמבנה הגיאומטרי של המוזיאון הוא מודולרי לחלוטין, ונפתח לתצפיות כוכבים בשעות מסוימות ביום. אותה הוא ללא ספק הגן הבוטני המהמם שצמוד לפרוספקט פארק. בכל יום נערך אירוע אחר בגן שקשור לפריחה, כמו שתילת עצים או סדנאות לילדים. שווה להגיע! מה עושים לפני ואחרי? שכונות הלואר איסט סייד וסוהו צמודות אחת לשנייה, וללא ספק שוות יום שלם של טיול. מדובר בשכונות עם היסטוריה אמנותית ותרבותית עשירה, שנחשבות היום לאחיות המגניבות של צ'לסי היוקרתית בעולם האמנות העכשווי. אז אם אתם קופצים לסיור איתנו בלואר איסט או בסוהו, הקדישו כמה שעות לשוטטות בסמטאות היפות של השכונות האלה. רופ טופ 93 בצ'יינה טאון הוא אחד הברים הכי יפים בעיר, עם תפריט מגוון ונוח לכל כיס. שווה להגיע להאפי האוור וליהנות מקקוקטייל שני חינם במחירים ממש מפתיעים. התאילנדית החריפה אנקל בון בסוהו היא מסעדה אותנטית לא מתנשאת שהמקומיים אוהבים. עם כל המנות הקלאסיות של המטבח התאילנדי ועוד כמה מנות עם טוויסט שלא תשכחו. Since the 1980s as part of the Young British Artists group (introduced by Damien Hirst), Sarah Lucas has created an expansive body of work, dealing with issues of gender and sexuality. Her first American museum retrospective at the New Museum is the largest exhibition of her work yet. “Sarah Lucas: Au Naturel” features some of Lucas’s most important projects, including early sculptures from the 1990s. From her photographic self-portraits to her stuffed-stocking bunnies, the exhibition presents an interesting take on one of the most important and controversial artists in the UK. Los Angeles-based artist Matthew Monahan has always been known for his mastery of both traditional and industrial materials. In his show at the Anton Kern Gallery, he presents a group of freestanding figurated sculptures and painting on aluminum, reflecting a physical and mental perspective on the history of figuration. By using primarily black and white mediums, Monahan forces the viewer to zoom in and out across the room to understand the objects in space, as they overlap and crossfade. in the most comprehensive exhibition of the artist’s work ever assembled. Best known for his works with neon, American artist Bruce Nauman employed a tremendous range of materials and working methods throughout his career, revealing how mutable experiences of time, space, movement, and language provide an unstable foundation for understanding our place in the world. Defying categorization, Nauman’s art constantly shifts between mediums, senses, and modes of experience. ​ performances and panel discussions with local cultural institutions. displays a diverse variety of cross-section photography from all over the world. festival offers nighttime projection programs, workshops, panel discussions and talks. חודש אוגוסט, החודש האחרון של עונת הגלריות בניו יורק, היה גדוש ומעניין - מי מכם שהצטרף אלינו לסיורים במהלך החודש יודע. אבל גם הגלריות צריכות לצאת לפגרה, ועד לתחילת העונה בספטמבר רובן יישארו סגורות. למזלנו, בניו יורק תמיד יש מה לראות בגזרת האמנות. One of the most famous installations of the Japanese artist, Yayoi Kusama, has been installed in an unusual location: Rockaway Beach in Southern Queens. 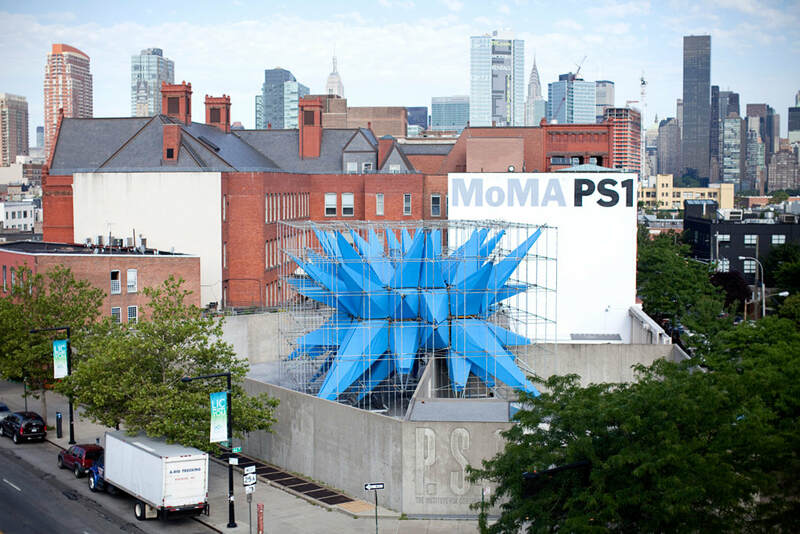 Presented by MoMA PS1, this public art experience is free of charge. 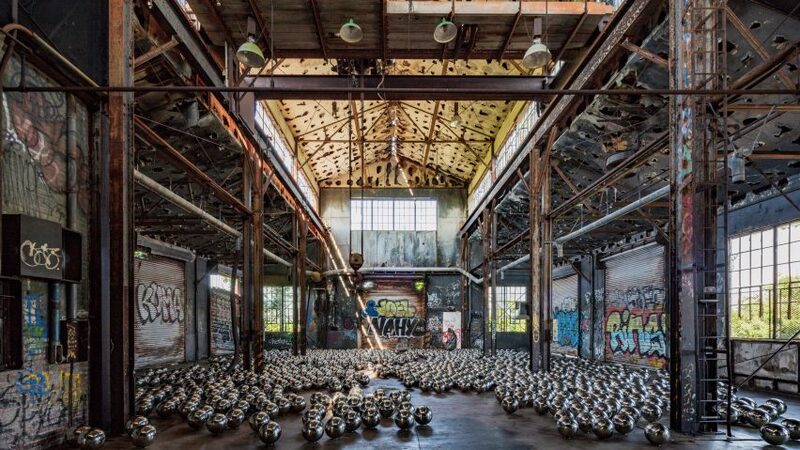 The installation, that was first featured in 1966, consists of 1,500 mirrored chrome spheres, now covering the floor of a former military train garage. The garage where the exhibition is displayed was one of many buildings that were damaged by Hurricane Sandy in 2012. MoMA PS1’s annual Rockaway! art installation is meant to bring awareness to the continuing hurricane recovery, and the effects of climate change. MoMA PS1’s Warm Up series, the museum’s annual music event, features an array of innovative and emerging music artists for 10 weeks during the summer. The audience and view some of the museum’s exhibits while listening to the concerts, which are staged within an architectural installation. This year’s lineup includes artists such as Valee, Lizzo, Cashmere Cat, Gang Gang Dance, Maxo Kream, and more. 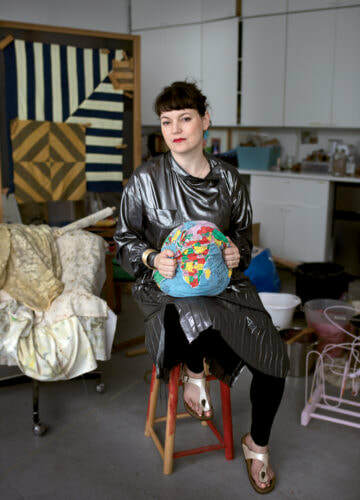 New York native Zoe Leonard solo show titled “Survey” feature A mix of photography, sculpture and art installations. Leonard covers various topics ranging from photography history to urban environment, conveying a variety of additional themes in-between. Zoe specifically attempts to let the viewer re-evaluate their perspective on everyday objects, her subject matter often rearranging the perspective and repetition of everyday scenes and objects. Like Life displays a variety of human sculptures from varying periods, from modern date all the way to the 1300s. The exhibit’s driving point is to show how people have depicted the human body in sculpture, specifically the level of detail to realism. Rather than this being a single artist’s project, this is a group effort done and hosted by The Met, including classic period, European-origin pieces on loan. It’s an exclusive exhibit that runs till July 22nd, so do give it a look. The entire exhibit is being hosted at the Met Breuer (Madison Ave.) in Manhattan. This art exhibition takes on a more traditional approach in its display media, hitting close to home with its subject matter. With over 300 color photographs, the artists follow the trail of discarded and broken objects, capturing every imperfection from their useless state. Gruyter and Thys have adapted the idea from the late Johannes, an old German painter from the later 1940s’. The Spring Performance Festival hosts various artists work and performances such as plays, music, video productions and solo pieces. It’s backed by Secret Project Robot, an alternative artist community based in Brooklyn. Aside from the featured performances, there will be “pop-up” artists and performances as well. The entire venue hopes to encourage people to interact with their current world through a display of art. SPRING/BREAK Art Show is an annual art fair dedicate to emerging artist and independent curators. While the Armory Art Week holds mostly traditional and established galleries, SPRING/BREAK is known as the fresh alternative. The seventh annual fair will be held at the former James A. Farley Post Office, a historic building in times square. More than 100 curators have been selected to present shows that draw on this year theme; "Stranger Comes To Town". ​New York premier fair for contemporary art will feature 200 leading international galleries, innovative artist commissions, and public programs. For the second time, The Armory show will spotlight “Platform”, a curatorial project featuring large-scale artworks, installations and commissions across Piers 92 & 94. selected projects include Berndnaut Smilde, an Amsterdam based artist who stages a theatrical set as a site for the repeated generation of a cloud. find his work at pier 94. Another Interesting work is by Wilmer Wilson IV, who will occupy Pier 92’s Publications Lounge to show a large-scale installation of a carved salt wall. Ebecho Muslimova is a New York-based artist who makes strikingly graphic paintings and drawings using sense of humor and absurd. The subject of her work is an alter ego named “Fatebe”, who finds herself in various impossible situations. One works features Fatebe as a genie inside a jar of coins, gagged by a stack of quarters. Another, as Narcissus poised over a pool of still water while folded into the angles of a laundry drying rack. Using minimalist, black and white graphic lines, Muslimova uses the female body as a malleable, expressive form, roasting shame and anxiety on a spit. Every curve glistens. Gavin Brown Enterprise in Harlem is showing a solo exhibition of artist and photographer, LaToya Ruby Frazier. Through photography, video, and performance Frazier explores social justice and cultural changes in America. " I use my artwork as a platform to advocate for others, the oppressed, the disenfranchised. When I encounter an individual or family facing inequality I create visibility through images and story-telling to expose the violation of their human rights.". Three bodies of work are presented in this show, Including Frazier's best-known body of work, The Notion of Family (2001-2014); an exploration into her family, her hometown, and her own experiences through landscape and portraiture in the de-industrialized steel town of Braddock, PA.
“Los Alamos,” the most famous body of work by William Eggleston will be on view at the met strating Feb 14th. “Los Alamos,” created over a nine-year period, documents Eggleston’s journeys through the American South and West. The exhibition includes color studies (used for the first time in the history of fine art), made during numerous road trips with his friends Walter Hopps and Dennis Hopper—to New Mexico, Los Angeles, New Orleans, Las Vegas, and elsewhere. Furthermore, the show will include photographs of the social and physical landscape of the Mississippi delta region, which remained at the artist’s home. 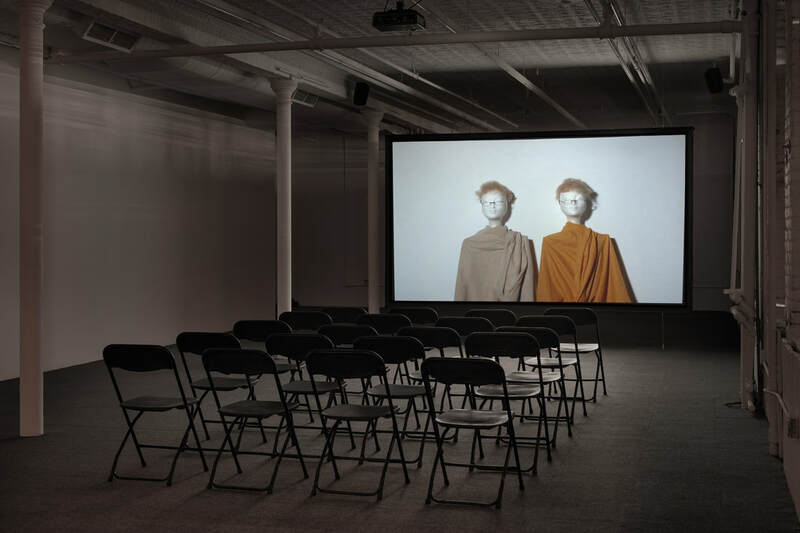 This is the first show of the Irish artist, Cathy Wilkes in New York and the largest exhibition of the artist’s work to date. best known for mannequin-populated tableaux that recast scenes of everyday life as surreal experiences, Wilkes works in multiple mediums. This show features approximately 50 works from public and private collections throughout Europe and North America as well as new pieces created for the show, offering a broad view of Wilkes’s work since 2004. American-born Andrew Mroczek and Peru native Juan Jose Barboza-Gubo started their collaboration in 2013 with a project called Virgenes de la Puerta (Virgins of the Door). This photography series is inspired by Spanish colonial painting that reimagines transgender women as historical and religious icons. Canon is a series of portraits showing LGBTQ Peruvians who identify with their country’s rich religious heritage. The artists reference the religious “canon” law, often targets and excludes LGBTQ voices and by that, expose us, viewers, to a different type of reality that exist far away from the mainstream western eyes. Norwegian artist Edvard Munch (1863–1944) is known mostly for the famous painting “the scream”. In fact, Munch attained fame early in his career for his depictions of human anxiety. This fascinating retrospective is taking place at the Lovely Met Breuer and reveal 43 of the artist's works created over a span of six decades, including 16 self-portraits and works that have never before been seen in the United States.